Fourteenth Ward Industrial School of the Children's Aid Society, 256-58 Mott Street (between Prince and Houston). Designed by the firm of Vaux & Radford and built in 1888-89. Calvert Vaux was an English-born and English-trained architect who, together Fredrick Law Olmsted, designed Central Park in the late 1850s. In 1872, the two dissolved their partnership. Vaux served as landscape architect for the Department of Public Parks from 1881 to 1883, and again from 1888 until his death in 1895. Beginning in the 1860s, the Children's Aid Society embarked upon a campaign to build shelters for abused and abandoned children in various parts of Manhattan. Between 1879 and 1892, the firm of Vaux & Radford designed nine facilities for the society, mostly children's shelters but also a House of Reception on West 27th Street. 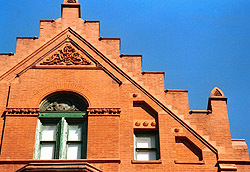 Typical of these buildings was the crowstepped gable roof seen here. The lovely bay windows in this design also featured prominently in many of Vaux's efforts for the society. Two strikingly similar facilities, built at the same time as this one, were the Jones Memorial Industrial School, on East 73rd Street near First Avenue, and the Rhinelander Children's Center, on East 88th Street near Second Avenue. Only the latter building survives, and it has been marred but a stucco coating.